Jericho Stewart (Kevin Costner; Dances with Wolves) is a maximum-security criminal who, because of a traumatic brain injury as a child, can't reason between right and wrong and feels no emotions. 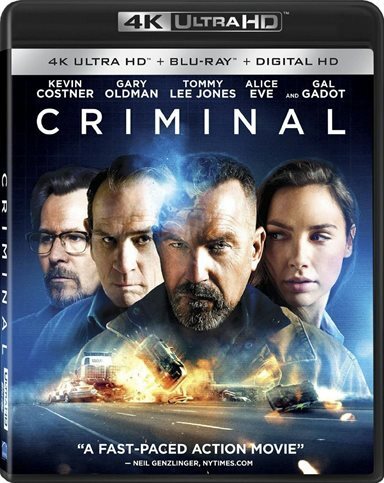 Criminal, the thriller film starring Kevin Costner and Ryan Reynolds, is out on shelves this week on 4K UHD, Blu-ray and DVD. The film, which also stars Tommy Lee Jones, Gary Oldman, and Gal Gadot (Wonder Woman) seems like it should be amazing given the cast. But what really has occurred here is a bit of a disappointment. William "Bill/Billy" Pope (Ryan Reynolds; Deadpool) is a CIA agent protecting a dark web mastermind, The Dutchman (Michael Pitt; Boardwalk Empire). Unfortunately, Pope gets killed by the people trying to find The Dutchman, and now the CIA are desperate to find him and his deadly program before it gets into the wrong hands. Dr. Franks (Tommy Lee Jones; Jason Bourne) is a neurosurgeon experimenting on memory transfer in lab rats. When the CIA seeks him out to perform his techniques on a human, he suggests the perfect candidate to receive Pope's memories. Jericho Stewart (Kevin Costner; Dances with Wolves) is a maximum-security criminal who, because of a traumatic brain injury as a child, can't reason between right and wrong and feels no emotions. He is the blank canvas Franks needs. However, when he starts remembering Pope's memories, it alters him in a way he is unprepared for. This sounds like a film that could be quite good, but, here's where the disappointment comes into play. This script simply was not up to par, and was a complete waste of this cast full of veteran actors, all with HUGE movie careers. These men could all have made this an outstanding film given the right material. But when you watch a film and feel like you can't connect to even these actors, something is gravely wrong. The 4K UHD video is presented with 2160p lines of resolution in a 2.39:1 aspect ratio. While Criminal was filmed in a higher resolution the special effects that were finished in 2K hampered the 4K conversion of the film. However, the new ultra-high definition color mix is out of this world. As with most 4K titles, the colors have been specially created for this release. Colors are warm, sharp, and vibrant just like one would expect from the next generation of home entertainment media. Unfortunately, the same can not be said about Criminal's audio. Opting not to go with a new soundtrack mix, the 4K UHD uses the same DTS-HD 5.1 audio that is found on the Blu-ray release. While this mix is quite good, it is a shame since so much more could have been done with a Dolby Atmos remix. As with all 4K UHD Blu-rays, Criminal's extras are included o the Blu-ray disc. These extras include a Digital HD copy of the film, two featurettes entitled Criminal Intent and Director's Notes, deleted scenes, and a music video for Madsonik's "Drift and Fall Again". While the two featurettes are a nice long length of about forty minutes, unfortunately a lot of deep content isn't there. It is nice for a change to see a film at least try to get better content to a disc than what has been almost zero as of late. I wish that I could have enjoyed this film more. These are all great actors that one should get excited about seeing perform together on a project, but this just didn't hit the mark, it it did however entertain me for the evening. Download Criminial from the iTunes Store in Digial HD. For more information about Criminial visit the FlickDirect Movie Database.